As a continued reader of Computer Music magazine since it’s inception, I have always been a strong advocate for any budding computer music enthusiast diy home producer to get a subscription. Now you’ll probably have noticed a banner or two on this site promoting this magazine and whilst it is true that this site benefits from these adds I have a genuine love of this magazine. Apart from the great interviews, tutorials and honest reviews it has been the strength of their free plugins. Two of the plugins that I have received are then Eareckon plugins. 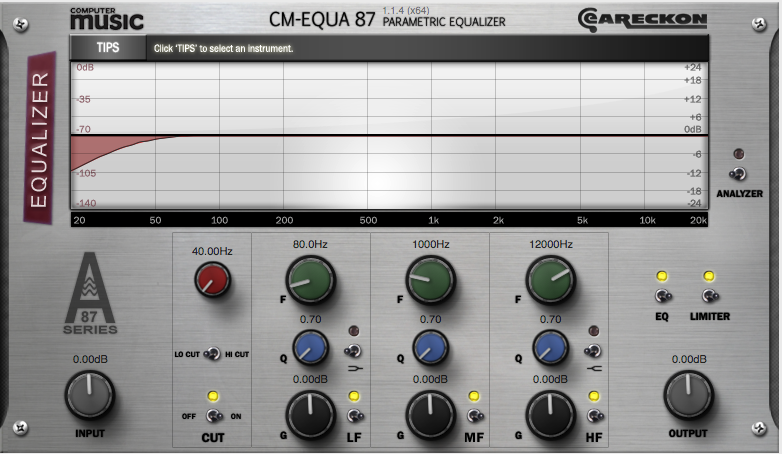 The CM-EQUA 87 is a great eq plugin and it comes in VST and AU format. I have used this plugin a lot, probably on more tracks than I can remember – I also own Waves and UAD plugins but I honestly can’t do with out this one – and if you are new to computer music you will find it valuable and damn easy to use. The same applies to the CM-COMP 87 – it also comes in VST and AU formats. It’s very simple to use and as a companion to the CM-EQUA 87 it’s a treat. To get these plugins you will have to own the magazines that they were offered with. You can get these as back issues either as hard copies or via iPad/digital media. If you are looking for hard printed copies you may be out of luck though, it’s possible you may be able to find them on eBay.